KIEV, Ukraine -- The Ukrainian military has denied knowledge of how its weapons made it into the hands of Islamic State group terrorists. 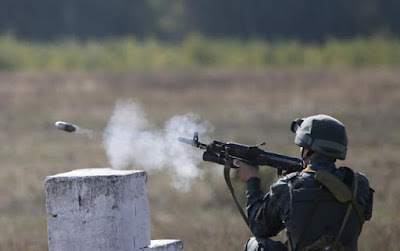 A Ukraine National Guardsman fires a gun during a drill near the village of Stare in the Kiev region, Oct. 2, 2015. Lebanese citizen Osama Khayat, who was arrested this week in Kuwait with other suspects, said he purchased arms in Ukraine that were meant to be delivered to the militant group in Syria via smuggling routes in Turkey. While there are a number of weapons involved, a FN-6 antiaircraft missile system was discovered by authorities. The FN-6, which is manufactured by China, has not formally been sold to Ukraine at any point, according to the Ukrainian military. But that doesn't mean Ukraine didn't obtain it from an alternative source. "Ukraine has not produced or purchased Chinese-made antiaircraft missile systems mentioned in media reports and has not provided transit for their transportation," the Ukrainian military press office told the Russian news service Tass Friday. It was not yet known if the deliveries were legal and made through Ukraine’s official Ukroboronprom arms seller or if they were stolen from military operations in eastern Ukraine, where pro-Russian separatists and troops loyal to Kiev have been fighting since April 2014. The Ukrainian military disclaims any knowledge of such sales, which are likely being conducted by the country’s criminal elements and not the military, a senior military source told Tass. "You should turn to law-enforcement agencies on this issue. I have nothing to report on this topic," Ukrainian military spokesman Vladislav Seleznyov said. Ukrainian Interior Minister Arsen Avakov has said the illegal arms trade in the country has increased considerably since the war began. Around 70 percent of weapons that are making their way onto the streets of Ukraine and further afield are reportedly coming from the contested Donetsk and Luhansk regions. Ukrainian citizens are in possession of about 6 million arms, compared with 3 million a year earlier, according to data provided by Tass.